“Discrimination saying ‘this one is a relative; this other one is a stranger’ is for the mean-minded. Time and again there have been genuine seekers, genuine spiritual aspirants or sādhakās asking me about the inner significance of the monument here, hence this brief explanation. Symbols of different faiths depicted here not only represent the various belief systems, but also the human intelligence. Not intellectuality; not scholarship; not the dogmas, doctrines, and creeds now associated with those faiths – but the inherent intelligence within all beings that has blossomed in the human species. Hence, these symbols, which are a mere representation of many, many more symbols that we cannot possibly depict all – must be considered and appreciated as all that is best within us from time immemorial. The lotuses around these symbols signify the ever-blooming nature of such intelligence. There are no full stops. We are ever evolving, ever blossoming. Elsewhere we shall discuss these symbols one-by-one, including those that may seem unfamiliar, representing the now extinct faiths, as also the faith of those, who due to our lack of understanding, we label as deviants and atheists. This celebration of human intelligence, then, is the first step toward Global Harmony. Simply put, human intelligence or all that is best within us is our very humanity, our humanness. In the words of the ancients, it is our dharma, the “Human Dharma” – the recognition of “our duty and responsibility” of being born as humans. Symbol of Ganeśa, the head of Ganeśa, often described as the elephant-headed god. Ganeśa represents Jñāna Śakti or the Power of Wisdom. Furthermore, here in the context of this monument, Ganeśa or the Power of Wisdom also represents energy in its purest form. Ganeśa’s presence here, as you shall learn in a while, represents the Proton of the Atom of the Battery to run the Yantra, the Tool, the Machine that we call the Global Harmony Monument. 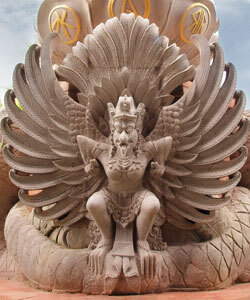 Garuda, the Eagle – representing the Neutron of the Atom of the Battery. In the context of our theme, or rather, purpose – Global Harmony – Garuḍa represents Kriyā Śakti or the Power of Action, of Soaring High, of Defying all the limitations, including the Power of Gravity that keeps the soul bound in the material world. Garuḍa also represents the Skies, the heavens, the stars and the galaxies, the seen and the unseen worlds and universes. The Nāga or the Serpents represent our realm, this very earth, where we stand, where we live. It is a reminder of our duty to care for the Gaia, for Pṛthvī, Mother Earth – of being realistic, humble, down-to-earth inspite of our ability to soar high. Together with the Garuḍa, the Nāga bear witness to our conviction “One Earth, One Sky, One Humankind”. If Ganeśa represents the Proton or the Jñāna Śakti, the Power of Wisdom; and, Garuḍa represents the Neutron or the Kriyā Śakti, the Power of Action – then, where is the Electron, and what does it represent? The Electron surrounds both the Proton and the Neutron, thus creating force-field enveloping the Proton and Neutron; and, in this monument represents our, your, my Intention, the Will-Power, or Icchā Śakti. Invisible, yet ever moving around the Proton and Neutron, the Electron opens up all possibilities, implying that it is the Power of the Intention, the Will Power that enlivens the other two parts of the Atom. The monument is in the shape of a liṅga, often translated as phallus. The actual meaning of the Liṅga is “The Sign”. In this context, it is the Sign, the Evidence of our Righteous, Sincere, and Truthful Intention. Having developed such intention, we can now proceed to activate this Yantra, this Tool for the purpose of Global Harmony. The Pañcamukha Yantra, the tool with five heads. There are four heads facing the four cardinal directions and one on the top. This Yantra was conceived and developed by the ancient sage Bharadvāja before the present past ice-age era. At that time a gigantic version of the Yantra was also manufactured for the purpose of intergalactical travel. And, the energy used for the same was measured not based on horse power, but on elephant power. Hence, the vehicle was called Gajākarṣaṇa Pañcamukha Yantra. Ancient Sanskrit texts with a full description on how to manufacture such vehicle by fusing three metals in a specific ratio were discussed by G.R. Joyser of Mysore in India, who later founded the International Academy of Sanskrit Research. Interestingly, a model of this Yantra was installed on the top of the Candi Sukuh Maṇḍala in Central Java about 500 years ago after the fall of the Majapahit Dynasty. For “whatever” reason, this was later removed and kept in the Jakarta Museum, where it was last seen by Prof. Dr. Victor Fik of Canada, who took a photograph of it and produced it in one of the volumes of his trilogy on Indonesia. No written record is available about the placement of the Yantra on top of the already existing Candi Sukuh Maṇḍala. However, the base material used for the Yantra, i.e. lava stone, and its placement upon a specific maṇḍala during those turbulent times in the history of the archipelago speak volumes. But, that is another story. Coming back to the Yantra on top of the Global Harmony Monument – this is a replica of the Candi Sukuh Yantra, commissioned by a “Man of Knowledge”, a name to reckon with, who knew the secret of the Yantra. I was fortunate to come in close contact with him during the last phase of his life. I still remember his words before leaving for Japan, where he had to undergo a surgery, “I shall be back soon, and we will discuss further.” Alas, he never returned. That was in the year 1986. He did mention that he had commissioned the Yantra but never mentioned the name or the address of the sculptor. 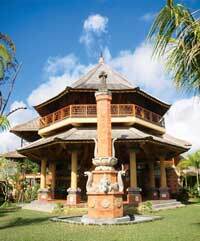 And, I forgot all about it until around 2006, when I spotted the Yantra outside a gallery in Bali. It was as if the Yantra drew me to it. The owner of the gallery did not know anything about it. Though, he mentioned that it was commissioned by someone “decades ago” (yes, must be before 1985), who gave him specific measurements etcetera, but never turned up to collect the same. Having seen my interest to buy it, the owner of the gallery mentioned a price that was easily three times of another similar sculpture. It was expensive. So, I drove off. The Yantra, however, kept calling me back… I tried to find out the name of the person who commissioned it, and the owner who was in his late 30s or early 40s said, “I wouldn’t remember. I don’t think I even met him. My late father was the one who got the order.” So, that was that; but, it did make me all the more certain that it was indeed commissioned by my old friend, and, indeed it was him drawing me to it. Later, when a Balinese friend came to know about my interest in it, I received it as a gift, for which I shall ever remain grateful. God bless you, friend. This is the Yantra that you see…. This has been installed for the specific purpose of “Global Harmony” – hence all the symbols, signs, as explained earlier. The Yantra faces the Divine Dame, Mother Goddess at Her Chapel. Together they form a Maṇḍala, a Modulus, a Model for Global Harmony. She, the Divine Dame is Śakti, Energy, Representation of the Feminine Force, Yin; and the Yantra represents Śiva, the Masculine Force, Yang. Using these Sacred Insignias, we can now invoke the Joint-Force within us. By doing so, by invoking this Joint Divine Force within us, we can actually further the cause of Global Harmony, for which a set of specific mantras or chants have been selected and empowered. You can become part of this Sādhanā, this spiritual practice, if you happen to stay in the Ashram more than 4 days, and, are willing to do so. Easy-to-follow step-by-step disciplines shall be explained to anyone desirous to do so, with a clear and honest intention to further the cause of Global Harmony. There are no charges, no fee for this special guidance given to anyone staying more than 4 days. If you are “moved” to make a donation, or what we call, love-offering, then such will be used for the upkeep of the Chapel and to further enhance the Yantra. Devotees of Mother Goddess from the West may also consider making a gift of statues of Mother Goddess in any of Her forms popular in the West (from the Roman, Greek, Egyptian Traditions, or any other ancient traditions). Such statues must, however, be made of metal (preferably Brass or Bronze) and has a minimum height of 8”, which is important for the purpose of consecration. Smoking and alcoholic beverages are not allowed in the Ashram. During this Sādhanā, however, it is suggested that you refrain from the same outside Ashram as well.